A new week, and another quilt is already well under way. Fabrics have been selected and most of the pieces have been cut, although arranging, re-arranging and editing is yet to be undertaken. I know you will again recognize many of these prints. Blue and green ... and they say blue and green should never be seen? It so also happens that I've cast on a new knitting project this week with the same great colors, and also with a Christmas deadline. (I finished the Buttonwillow Shawl earlier in the week and it is now blocking! Pictures soon). Yes, I am pushed for time in a big way, but I'm enjoying every single moment. 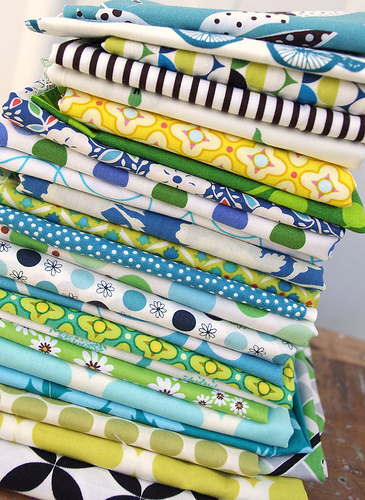 this is a VERY nice stack of fabrics, rita! I cannot WAIT to see this progress. I am intrigued by the limited color palette -- and these are my colors! Oh I love those two colors together! Who says they can't be seen in each other's company?? My two favorite colors, I can't wait to see what this turns into to! What a lovely selection of fabrics, I'm looking forward to seeing the WIP. Holy cow you manage to get a lot of quilting done! ^_^ I wish I was so dedicated. I can't wait to see the progression pics! Actually I love blue and green together, provided they are the right shades. Hmm....I always heard it as "Red and green should never be seen, except in the streets of Aberdeen." Blue and green looks gorgeous! 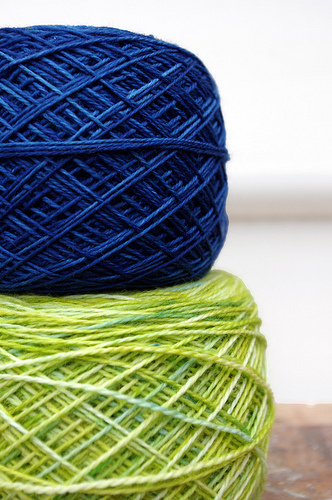 I love that green variegated yarn. I have not been knitting for a long while but my two 8yo nephew&niece just got the hang of it yesterday. Thanks to their great aunt. I keep retuturning to blue and green as my favorite colors. They are the 2 colors I used in my oldest son's room some 30 years ago. It is such a pretty combination, something about forest and sea. I am liking those fabrics for your next quilt. Pretty green you are knitting with. Your work is so beautiful...it sings to me!!! I want one of your quilts for Christmas!!! I love the stack. Blue, green, and yellow are my favs together. Can't wait to see the finished quilt! 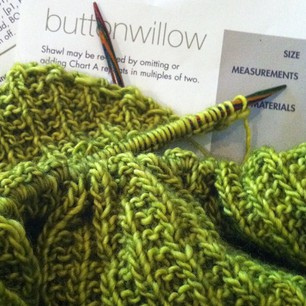 OOO-I'd love to see the Buttonwillow finished scarf. Bet it's delightful! 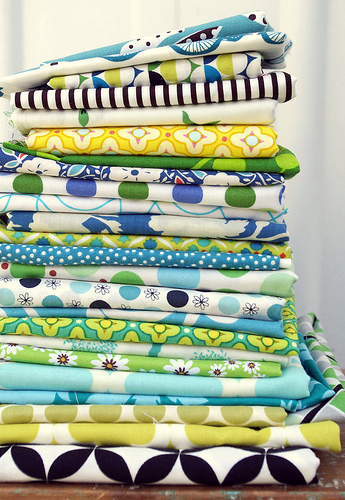 Beautiful stack of fabrics! Good luck! I would love to look at your fabric stash someday. Your fabrics are amazing. You seem to have a lot of crafting on your plate! I agree- amazing fabrics! These are so fun, and pretty summery, which sounds great on a cold winter day like this!